Your Android phone used to be an ad-free paradise--a place where you could play games, check email, and make a few calls, all without being bothered by those pesky sales pitches that have taken over your PC. But not anymore: As Android's popularity has grown, so too has its attractiveness to advertisers. Ads are arriving on your Android phone, inside games and apps, in your mobile browser, and even as push notifications. These ads distract you when you're playing a game, blink and flash when you're simply trying to browse the Web, and eat up the little bit of data available on your not-so-unlimited data plan. What's an Android user to do? Hope is not lost: We can help. No, we can't promise an ad-free experience--nor would we want to. Remember, some websites and app developers rely on ads to stay in business. But we can suggest ways to cut down on bothersome ads, at least to a certain degree. If you browse the Android Market, you'll see a number of apps that promise to block all ads on your Android device, but the vast majority of these apps--such as the well-regarded AdAway, NetSpector Sniffer/Ad Blocker, or AdFree Android--are available only for rooted phones. The reason these apps work exclusively on rooted phones is because they often make changes to the hosts file, something that's allowed only on rooted devices. If you've rooted your Android phone, you can try any of these apps and see if they work for you. For this article, I did not test any ad-blocking tools that required a rooted phone. Note: Rooting a smartphone gives you complete control over your handset, allowing you access to all of the files on your device. With a rooted phone, you can remove unwanted software, run root-only applications (such as ad blockers), and install other versions of Android (known as ROMs). However, you do void your warranty when you root your phone. Folks who don't want to root their phone have a few other options. One such app is the $2 Ad Blocker & Data Toggle. I tested this app on a Motorola Droid Bionic, and had some trouble getting it to work. It installs easily enough, and when you launch the app, it brings you to a list of your installed applications. From there, you can choose which apps you'd like to block ads from. The process is simple, but on my handset the application didn't always work as advertised. 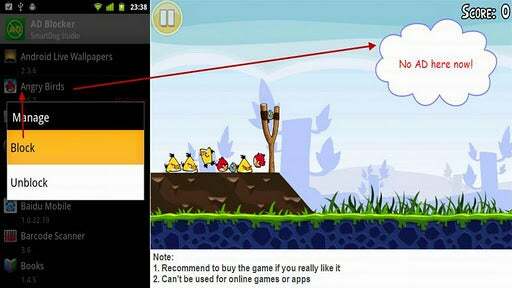 For example, I selected the option to block ads from Angry Birds, and it worked only part of the time: When I launched the game, I sometimes saw ads and sometimes didn't. John Huang, the developer of Ad Blocker & Data Toggle, says he created the app because he knows that many users don't want to be bothered by ads, especially those users who let their children play games on their phone. He says the app works by turning off the Internet connection when you open the game or app that you've selected. Without an available data connection, the app cannot access advertisements--but that also means you cannot use the utility to block ads in apps that require an Internet connection to function. Users can simply turn off the Internet connection on their own, Huang says, but he adds that his app streamlines the process and restores the connection automatically when you exit the game you're playing. He also says that switching your device to airplane mode will accomplish the same result, but notes that in doing so you will miss incoming calls and messages. Although the manual approach may involve slightly more work, I actually had better results with it. I switched my phone to airplane mode and played Angry Birds ad-free, to my heart's content. The game occasionally reminded me that I was not connected to the Internet, but I could dismiss the notification easily. I handed the phone to my 6-year-old to see if the notification would faze him, and he blew right by it in his quest to destroy the pigs. Android Adblock isn't the easiest app to use. Of course, turning off your data connection won't help you when you want to browse the Web. Luckily, several apps can help prevent ads from ruining your Web surfing. For instance, I tested Android Adblock, a free app that's still in beta. Using it is a bit of a challenge, as you have to install the app and then manually add blocking rules or filters. I contacted the developers for help with this process, as I was unable to add any filters correctly, and they admitted that it can be difficult for new users, as it requires some technical knowledge. Far easier to use was the Adblock Plus extension for Firefox. I downloaded Firefox for free from the Android Market, and added the popular Adblock Plus extension without issue. After a quick reboot of my phone, I was browsing in a nearly ad-free environment. Much like its desktop counterpart, the mobile version of Adblock Plus blocked most of the annoying, flashing ads that drive Web surfers mad. I still saw the occasional static banner ad, but I noticed no pop-ups, animated ads, or flashing ads while browsing the Web. You can also take a manual approach to blocking some ads in your mobile browser. One option is to turn off Flash, which you can accomplish through the browser's settings menu. When your browser is open, tap the menu button, and then select More, Settings, and Enable plug-ins. From there, choose On demand. Afterward, when a Flash object appears in your browser, you'll see an icon, which you can tap to play the Flash object. Many mobile-ad companies give you ways to opt out. Blocking ads that arrive via an annoying push notification is more of a challenge if you don't want to root your Android phone. Still, you do have a few options. The first one is to avoid any applications that allow such ads in. It may sound obvious, but read the fine print, including user reviews, before installing any apps to your Android phone. If an offending app is already on your phone, but you're not sure which one it is, try an app such as AirPush Detector or Addons Detector, each of which can find ad-friendly apps living on your phone. Such messages are delivered from ad networks and mobile-marketing firms, including AirPush, Appenda, LeadBolt, and Moolah Media, many of which allow you to opt out of their offerings. AirPush, for example, provides a Permanent Opt-out app that you can download from its site. Appenda's site includes a Global Opt-Out Form, and LeadBolt's site lets you opt out of its services, as well. Blocking ads from appearing on your smartphone may seem like your right, but remember that such a move isn't always welcomed, especially among the developer community. In an email exchange with me, an Android developer named Chris (aka KreCi), who blogs about the income he derives from developing Android apps, noted that he's not worried about the use of ad blockers--at least not yet. "Ad-blocking software makes no big differences [to my income], as it is a very small percentage of all users that use the software," he says. Other developers aren't quite as lax, though. Scrolling through online forums where users are looking for advice on blocking ads, you'll often find angry replies from developers who are worried that these users are disseminating tips that will deplete their income. Some Android users even take offense at the use of ad blockers, but more are offended by what they perceive as the obnoxious nature of the ads themselves. Most Android fans agree that those developers who go overboard--stuffing ads in every nook and cranny, interfering with the navigation of the app, and even affecting the use of the phone--ruin things for everyone else. In a perfect world, all of the time and money you spend researching ad-blocking methods and paying for ad-blocking apps could be better spent. Until that world arrives, however, you can look for apps that have earned positive user reviews for a reason. And, if it's possible, why not opt for the paid, ad-free version of an app ? That way, you can support the developer and avoid annoying marketing messages. The long-awaited Droid Bionic is blazing fast and has a slew of great entertainment and business features, but the high price might make it a hard sell.